Someone at work dropped a flyer into my office today for the UK launch of the Samsung Galaxy Tab 10.1 Android Tablet. The first lucky 50 people to purchase the 10.1 inch tablet (16Gb WiFi version £399) at PC Word on Tottenham Court Road would get a cool £100 of accessories free at the launch event. Now Samsung have been doing really well in the Smartphone market of late, reportedly outselling Apple in the last quarter. This is mainly down to the Galaxy S and S II both of which are Android smartphones. I wasn't quite sure what to expect from the event, maybe a handful of geeks but it was quite different. A good number of people and very much event managed with canapés, drinks and even a DJ. But back to the product which is in many ways exactly what I expected. It is actually thinner than an iPad and it feels really great to hold. Solid in an iPad way and really well built but thanks to a textured back it felt easier and safer in the hand than the "bare metal" experience of an iPad. In short it is really desirable to look at and touch. Specification wise it seems to match and beat the iPad on most fronts. Less ports than most Android tablets again makes it really iPad like (even down to selling the SD and USB ports just like Apple do). 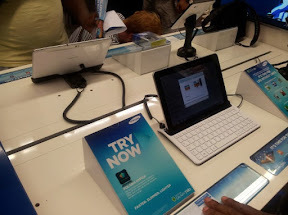 They had quite a few accessories including the pictured good-sized keyboard dock. Nice looking keyboard although not as practical to carry around as an Asus Transformer or iPad with Logitech Zagg keyboard. But the keys are certainly bigger. I didn't take advantage of the offer this time but this looks like a really great tablet. Maybe it will kick off some more development of Tablet apps for Android as this really is the weak area compared to the much more mature and established iPad apps. I expect there is actually a good chance of this, after all there are plenty of Smartphone Android apps and pretty much everything comes out for both iPhone and Android now. I hope to get my hands on a Galaxy Tab 10.1 soon for a few days so I can write a full review.